Sh. L.K. 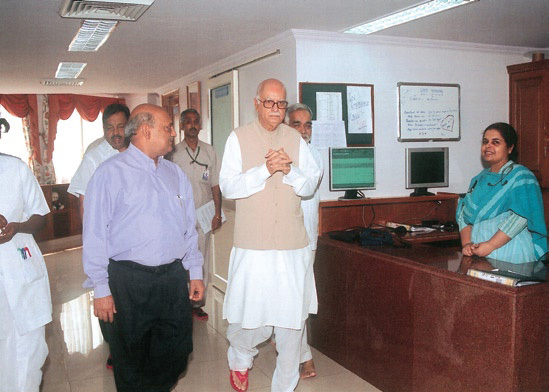 Advani, Leader of the Opposition during his visit for the inauguration of an eye camp on 2nd October 2006. Sant Parmanand ji Maharaj of Bhagwat Bhakti Ashram Rewari (Haryana, INDIA) established the mission in 1933 to enable the poor and needy to avail modern and scientific treatment free of cost. This aim has remained the sole guiding force for the various changes necessitated by changing circumstances. However the cost factors threatened to reduce the medical facilities run by the mission to irrelevance, thus creating a situation of poor & needy being treated by 2nd grade professionals with the help of obsolete equipment. The mission met this challenge by commissioning a multi-speciality general hospital and charging the classes for their treatment to serve the poor and needy masses by providing free / subsidized treatment, including medicine and diet. To achieve this end the mission undertakes the following activities. 10% of the bed strength – 14 beds in General Ward category where the patient pays for consumables and subsidized rates for Lab investigations. Doctor fees / room rent/ OT, diet and nursing care are free. In addition one bed each in Medical,Surgical & Neonatal ICU’s has been earmarked as General Ward Category Bed. There are 36 Economy ward beds which are subsidized and the patient pays at 60% of the normal rates for the investigations, doctor’s fees and visits and operations. Free General OPDs in all specialities and super-specialities in the morning hours on all working days. Free life and limb saving treatment 24 hrs a day in casualty. Subsidized investigations at 50% of the normal rates for patients in General OPD and General ward and 60% of normal rates for Economy ward. Meeting the cost of medicine and consumables in case of very poor patients. Conducting free eye surgeries through “Eye Restoration Scheme”. Free Surgery camps sponsored by Philanthropist individuals and organizations. Free Cancer detection Camps by Dept. of Gynaecology and Obstetrics. Free Camps to correct Orthopaedic deformities in Polio-effected individuals and distribution of free wheel chairs and other appliances. Free Hepatitis –B Injection Camps. Free Medical Treatment Camps for children in near by Villages. Free Eye and General physical examination for police personnel. Sant Parmanand Hospital was established in 1933 as an Eye Hospital by Sant Parmanand Ji of Bhagwat Bhakti Ashram at Rewari, with the aim to provide free treatment to the poor and needy. The hospital shifted to Delhi at its present location in 1955. In order to continue giving more medical facilities to the weaker sections of the society the management decided to convert it into a General Hospital in 1997. Instead of giving totally free treatment by consuming the donations, we decided to create assets using the philanthropy of our patrons, so that the modern facilities thus acquired can attract paying patients. The revenue generated from these services is being spent on patients who need financial assistance. The hospital has worked on this philosophy very successfully over the years. 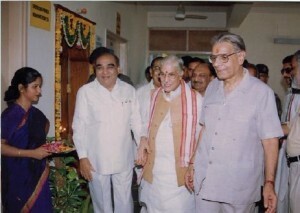 Hon’ble Dr. Murali Monohar Joshi, Minister for Human Resource & Development during his visit for the inauguration of an eye camp on 2nd October 2000. 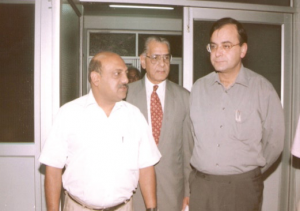 Hon’ble Arun Jaitely, Union Law Minister during his visit for the inauguration of an eye camp on 30th October 2000. In the year gone by the hospital has shown an overall growth in each and every department. Both the outpatient and inpatient numbers have gone up substantially. In this year we have also laid the foundation stone of our Nursing College and Hostel at Burari. This truly is a milestone in our history! We have purchased a world class central sterilization machine for our OT; in addition the hospital has also purchased a Mammography and OPG Machine. We have also installed our own MRI machine. Dignitaries from different fields of life visited us & were extremely happy & impressed with the work being done in our institute. Smt. 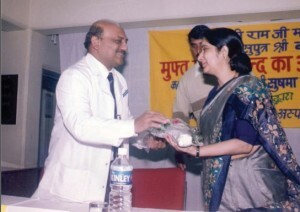 Sushma Swaraj, Union Minister for Information and Broadcasting during her visit for the inauguration of an eye camp on 1st December 2001. 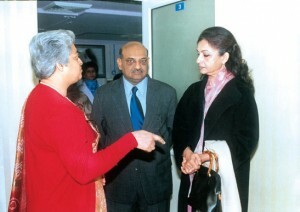 Sharmila Tagore during her visit for the inauguration of our Birthing Centre on 26th December 2003. We shall strive to achieve greater laurels for our institute and continue to provide world class medical facilities to our patients. This requires continuous up-gradation of our equipment & services. We hope to give the final finishing touch to our Nursing College and Hostel at Burari; this would benefit not only the hospital but also nursing students from different states of our country, thereby placing our hospital on the national map. We will also be renovating our canteen and handing it over to ‘Cafe Coffee Day’. In addition we are also looking at renovating our Jamuna Bazar Building so as to accommodate certain additional facilities for our patients. Hon’ble Vice President of India, Sh. 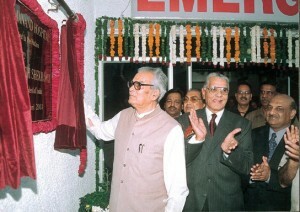 Bhairon Singh Shekhawat during his visit for the inauguration of our OT Complex on 8th April 2003. Sarod Mastero, Sh. 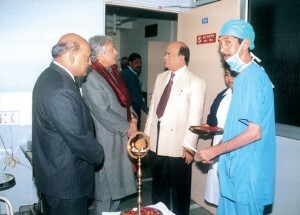 Amjad Ali Khan during his visit for the inauguration of an eye camp on 5th January 2005. We shall strive to give the very best of medical care to all our patients and live up to their expectations. This requires continuous updation of our equipment & services. We are working to add on certain additional facilities like a Cardiac Centre with a Cath Lab and also to boost our Urology Department with the addition of a lithotripter. Our Dialysis Centre is extremely busy and has a substantial load, we would therefore like to add a few additional machines and open a dedicated centre for Dialysis. All this would require a large amount of space which could only be possible after the renovation of the Jamuna Bazaar Building. We have taken up the case with the authorities who have assured us all possible help for the same.